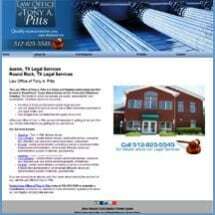 The Law Office of Tony A. Pitts, located in Round Rock, Texas, is a civil litigation and probate law firm. At our law firm, we believe in providing quality legal representation and dependable and accessible client service. The civil litigation representation that we offer is for either the plaintiff or the defendant in civil lawsuits related to consumer protection, creditor and debtor disputes and legal disputes between landlords and tenants. In the area of foreclosures, we represent the defense only. While past results are not an indication of future success, Tony Pitts is a lawyer who is proud of the high success rate he has achieved for clients thus far. In all areas of law in which we practice, our law firm offers a fair and flexible payment structure. The Law Office of Tony A. Pitts also represents clients in matters related to estate planning and probate. We help clients with all of the basic elements of estate planning, including wills, trusts, powers of attorney and living wills or health care directives. In the area of Texas probate, we assist clients with estate administration, guardianships, determination of heir ship, small estate affidavits and related matters. At The Law Office of Tony A. Pitts, our civil litigation and probate and estate administration clients are provided with quality representation they can depend on. Our Round Rock law firm also represents clients in Williamson County, Travis County, Hays County, Bastrop County, Bell County and the surrounding counties in Texas. Law Office of Tony A. Pitts of Round Rock, offers civil litigation services. For general court cases, we are committed to seeing your case resolved in the best way possible. We offer probate and estate planning services. Planning for your own passing or dealing with the legal process after the passing of a loved one is difficult. We strive to make these experiences as manageable as possible for you. If you are looking for an attorney who truly cares about making the law work for you, call the Law Office of Tony A. Pitts.